If you wish to create a question which allows learners to choose many correct answers, just use Multiple Response questions. Let’s learn how to work with this question type in the below tutorial. Basically, a Multiple Response question is similar to a Multiple Choice question. It contains multiple answer choices. But the key difference is this question type has more than one correct answer. 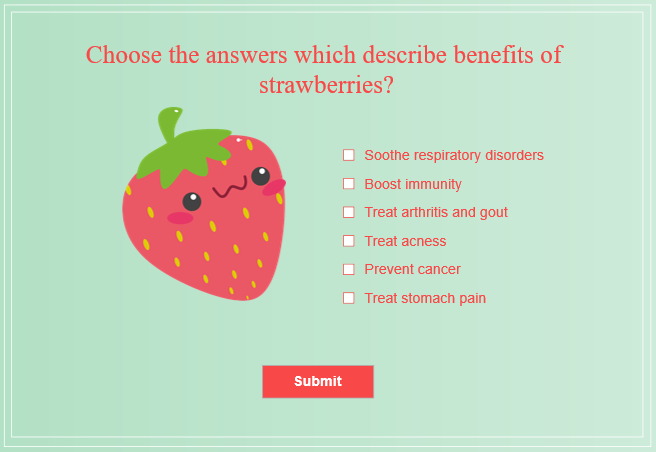 Let’s say you want to ask learners to find out benefits of strawberries. In this case, it’s a good strategy to use Multiple Response questions. 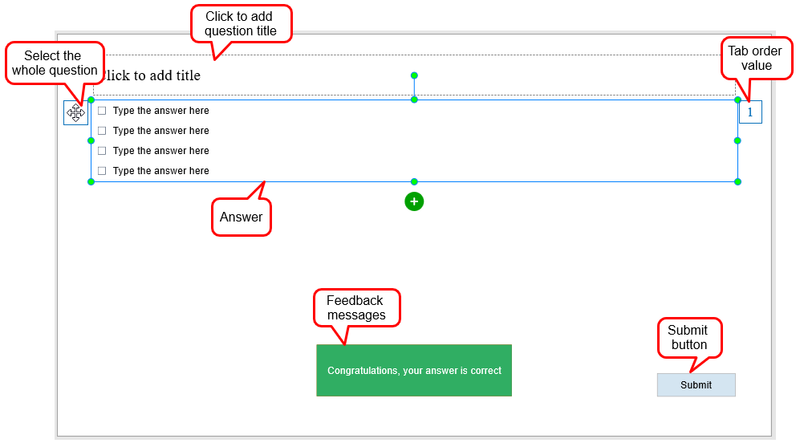 Like other eLearning questions, Multiple Response questions are also useful to assess learning performance. But be careful when you intend to use this question type as learners can guess answers. Here is the technique to create Multiple Response questions in ActivePresenter. In the Interactions tab > Multiple Response . In the Home tab > Interactions > Multiple Response. Then, you see a question slide like this. A Multiple Response question has three parts. The top text box is where to add the question title. The middle part contains answers. The third part has feedback messages and a Submit button. Each answer choice comes with a check box. Freely format this check box if you like. You can remove and add more answer choices if you want. You’re free to edit the text for answers. Note: To change the tab order value, first select the question. Then, access the Properties pane > Interactivity > General. For the following steps, see Using Tab Order. Add answer choices: Select the question and click the green button (1). Then, the app adds a pair of answer choice and check box towards the bottom. Delete answer choices: Select one or more answer choices and press DELETE. Alternatively, right-click the answer choices and select Delete. Change question layout: Select the question. Then, go to the Properties pane > Size & Properties > Group Layout. As can be seen, the Grid mode is selected by default. To change the question layout, customize properties the way you want. The Group Layout feature is useful to arrange each answer choice of the question in any position of the slide. See Group Layout of Questions for more details. Change answer choices’ position: Select the question. Then, go to the Properties pane > Size & Properties > Group Layout > None mode. After that, click and drag the answer choice to your desired position. 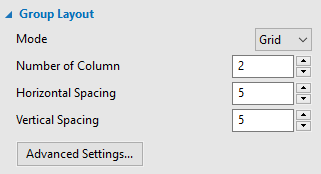 Resize the question: Select the whole question and drag the resizing handles. Or, access the Properties pane > Size & Properties > Transform > type values in the Width and Height boxes. When you’re done with this, if you want to restore the original size, right-click the question and select Reset Placeholder. Edit check boxes: Free to format and style check boxes like you do with a normal check box. See Working with Check Boxes and Radio Buttons for more details. Add text to answer choices: Click the default text to open the inline text editor. Then, enter text. You can type anything, from alphabet to special characters. Tip: After customizing the question/check box, right-click it and select Set as Default Multiple Response Question/Set as Default Check Box). After that, this question/check box appears each time you insert a new Multiple Response question/check box. To set the correct answer, double-click the check box that corresponds to the correct answer choice. It’s as simple as that! 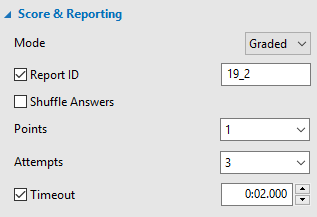 To set scores and reporting for a Multiple Response question, select the question first. Then, go to the Properties pane > Interactivity > Score & Reporting. This shows you the Score & Reporting section like the screenshot below. This section provides a lot of useful options. For example, you can select Graded or Survey to create a graded or survey question. Also, Shuffle Answers is a practical feature which allows shuffling answer choices. For more details, see Defining Score and Reporting for Interactive Questions. Step 1: Select Partial in the Points drop-down list. Step 2: Select any answer choice. Step 3: In the Properties pane > Interactivity > Score & Reporting. Select a point from the Points drop-down list. Or, enter your desired point. Basically, Multiple Response questions have default events and actions. But you can change them or make them more advanced as you wish. To do that, select the question early on. Next, go to the Properties pane > Interactivity > Events – Actions. If you’ve selected the Graded mode early on, this is what you’ll see. In the Graded mode, a Multiple Response question has four events: On Correct, On Incorrect, On Timeout, and On Incomplete. But it just has three events: On Complete, On Incomplete, On Timeout in the Survey mode. See Working with Events – Actions to learn more. The app offers default feedback messages for this question type. However, you’re free to remove or add messages if you want. So, you can show your feedback in the right place at the right time. See Working with Feedback Messages to get more details. 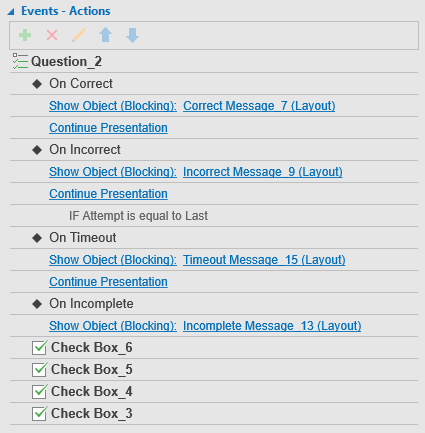 Now you’ve learnt how to work with Multiple Response questions in ActivePresenter 7. Don’t forget to use this eLearning question in your future projects.